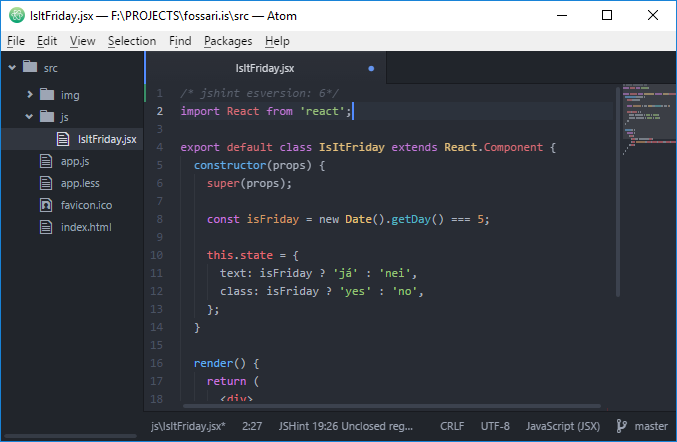 I recently started using Atom, this awesome web-based editor from GitHub. My previous editor was Sublime Text but I decided to make the move. Why? Because Sublime has a slow development. Version 2 of Sublime Text was initially released in 2011 and last release was in July 2013. Still it’s the main version! Version 3 last release was in March 2015 — and it’s still in beta and hasn’t gotten an update for 10 months. Don’t get me wrong, Sublime is awesome, but it’s not under active development. Atom is very active and has been from the start, Sublime is not. Atom is also open-source, Sublime is not. However, this is about my Atom setup, not a rant about why Atom is better than Sublime. I’m running version 1.4.0 of Atom on Windows 10. I prefer a dark theme so I chose One Dark UI theme and One Dark syntax theme. It’s just awesome. I have only two custom keyboard bindings. CTRL+SHIFT+L is for the multi-line selection feature. This is the same binding as in Sublime. CTRL+SHIFT+R is for auto indentation. My stylesheet is very simple. I only have this custom indentation styling for the indent-guide-improved package. You can see the output on the above screenshot. emmet – For easy typing bunch of HTML with CSS-like abbreviations. indent-guide-improved – For the awesome customizable indentation guides in my code. See in the screenshot above. minimap – Minimap for scrollbars. Very useful when exploring code. open-recent – Adds a “Open Recent” menu under Files. Really useful. react – Bunch of React stuff; syntax highlighting, indentation, snippets, auto completion, reformatting, etc. todo-show – Really useful if you have some TODO comments in your code. I also use most of the core packages. This is why Atom is so awesome, even at its core it’s packed with features.